A harmonised EMODnet Digital Terrain Model (DTM) has been generated for European sea regions from selected bathymetric survey data sets, composite DTMs, Satellite Derive Bathymetry (SDB) data products, while gaps with no data coverage are completed by integrating the GEBCO Digital Bathymetry. 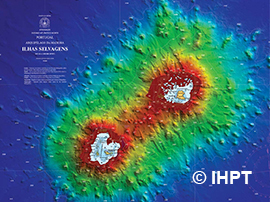 The DTM with its information layers is made freely available for browsing and downloading through the Bathymetry Viewing and Download service. In October 2016 a version of the EMODnet DTM had been released with a grid resolution of 1/8 * 1/8 arc minutes. In the meantime more survey data sets have been gathered from an increasing number of data providers and activities have been undertaken for correcting identified anomalies, where possible. This has resulted mid September 2018 in the release of a new DTM, now with an increased grid resolution of 1/16 * 1/16 arc minutes (circa 115 * 115 meters). The latest 2018 DTM data product is freely available to users as GIS layers for viewing, while both DTM versions (2016 and 2018) are also available for sharing as OGC web services (WMS, WFS, WMTS, WCS) and downloading as DTM tiles in several output formats. The DTM cells contain references to the data sets as used by CDI references for survey data, Sextant references for composite DTMs or alternatively a reference to GEBCO in case no data was available. The geographical boundaries of the 2018 DTM service are set to: N90 W36 and N15 E43. 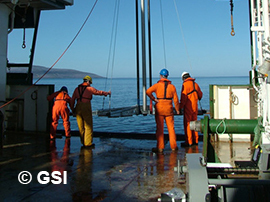 The geodetic system for the grid is chosen as WGS84. The EMODnet DTM is generated by regional teams from the EMODnet Bathymetry partnership. All regional teams follow a common QA-QC process and DTM generation methodology. Users can activate and view the various information layers. Users can zoom in/out and switch on/off several layers. Per DTM cell users can call up and browse the data as specified in the QA/QC documentation including retrieving metadata about the underlying data source. Users can draw transects and retrieve the bathymetric profile along that transect. Moreover users can download the DTM data in several output formats, in ASCII CSV, ESRI ASCII, NetCDF (CF), GeoTIFF and Fledermaus SD files. The downloading of the DTM is done in large tiles that users have to select. For the 2016 version there are 16 tiles, while the 4 times larger 2018 version is downloadable in 64 tiles. Online 3D viewing service: 3D visualization functionality has been added to the bathymetry viewing that can be used in the browser without requirement of plugins. The 3D application is based on Cesium. However a dedicated data structure has been developed by EMODnet Bathymetry based on a triangulated irregular network (TIN). Having a TIN instead of a regular grid enables faster representation of the complexity of the map (i.e. the number and size of triangles). Software has been developed to create tiles in quantized mesh format out of a raster format such as used in EMODnet DTM. A report about the approach can be downloaded while the software is made available at GitHub. 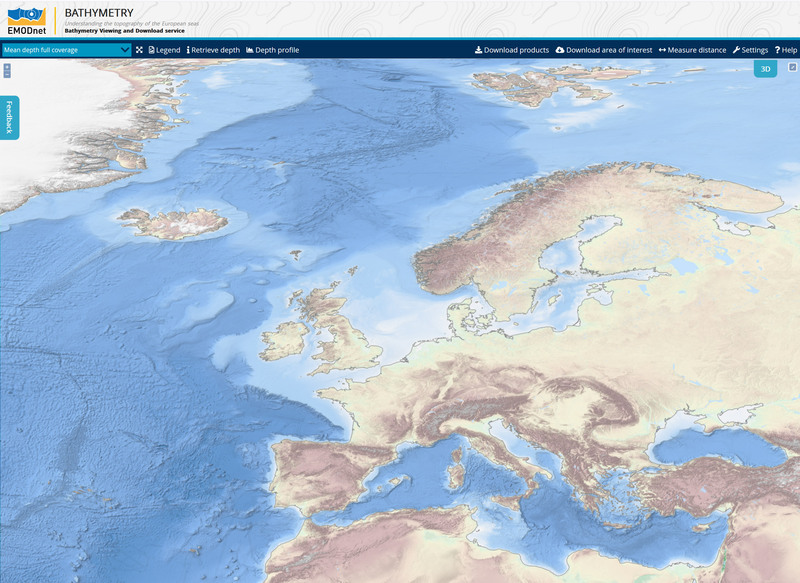 Offline 3D Viewer: the DTM files in NetCDF format can also be visualised by using the 3D visualisation tool (3D Viewer) that has been developed in the EU FP7 Geo-Seas project. This viewer is based on the existing open source NASA World Wind JSK application. This software is freely available after registration and allows the visualisation of Digital Terrain Models (DTM) in the existing GLOBE NetCDF format and Web Map Service (WMS) which are plugged into a virtual globe. More info about the 3D viewer and link to the registration page can be found here. The SD files can be visualized with the free Fledermaus 3D viewer software. The DTM infornation layers are also provided as OGC web serrvices which allows machine-to-machine exchange with other web portals.